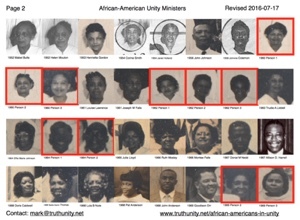 Download "African Americans Ordained in Unity (Pictures) November 28, 2017"
Here is a six-page document that lists African Americans who have become ordained Unity ministers, complete with pictures and the year of their ordination. 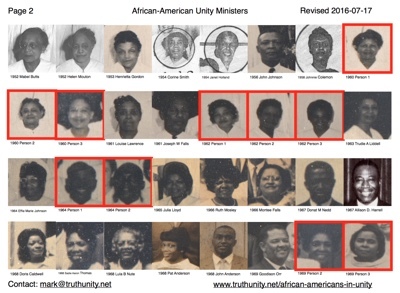 In June 2016 it was decided that having a list of African Americans who had been ordained as Unity Ministers would be helpful for a session at the Unity conference about African Americans in Unity. Dr. Catherine Thomas is leading this project and she is being assisted by Rev. Dinah Chapman and Mark Hicks, LUT. We need your help. Can you help us? Are there any African-American Unity ministers who are not listed? Three women in 1960 are: Catherine G. Brooks (deceased 12/23/1990), Myrtle Moore, (deceased 1/29/1965) Lois Anderson (deceased 5/30/1985). Three women in 1962 are: Flash Amber Washington, Ida Bowles (deceased 7/14/1999), Ester Stewart. Two men in 1964 are: Awa Njoku Sr., Samuel Uba Oti. Do you have a better photograph? Do you have any recollections of some of the early ministers that you can share? 07/20/2016. 1983 Mercedes R Hill identified by Rev. Karen Saunders. 07/20/2016. 1983 Alfreda Williams added and identified by Rev. Karen Saunders. 07/18/2016. 1993 Ricard Talley added. 07/14/2016. 1969 Goodison Orr identified by Sheila McKeithen. 07/12/2016. 1967 Allison D. Harrell identified by his widow, Whilmetta D. Harrell. She also provided a better photograph. 07/12/2016. 1967 Donat Nedd. Identified because he was the remaining of two unidentified men for 1967. According to Ancestry.com, Donat Nedd married Johnnie Colemon in 1967 and passed in 1984. 07/12/2016. 1968 Doris Caldwell identified by Whilmetta D. Harrell. 07/12/2016. 1968 Sadie Thomas identified by Whilmetta D. Harrell as Sadie Aaron. She was ordained as Sadie Thomas. 07/12/2016. 1968 Lula B Nute. Identified because she was the last of three unidentified women for 1968. 06/22/2016. 1970 Louise Odem identified by Alberta Ware (and confirmed by Whilmetta Harrell). 06/22/2016. 1970 Verda Scales identified by Alberta Ware (and confirmed by Whilmetta Harrell). 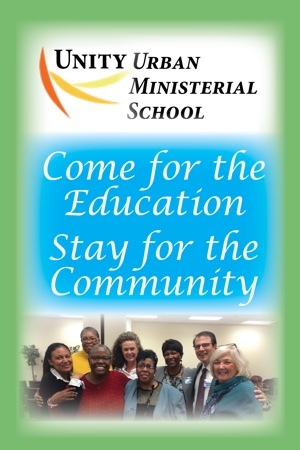 If you have been inspired by this page, then why not consider making an offering to Unity Urban Ministerial School?